flyDirect have changed their timetable again - I think this might be the third version since they started advertising on the 29th of March. Wellington is now the big winner receiving two flights a day to Wanaka instead of one, as advertised as recently as last week, while Christchurch loses one flight a day and will only have a morning flight to and from Wanaka. This seems to make more sense. The package deals, which include a rental car, must be much more attractive to North Islanders than South Islanders for whom driving to Wanaka one's own car is still an option. Beech 1900D ZK-EAC at Auckland on 30 September 2008. While many Eagle Air pilots will have Beech 1900 ZK-EAC in their logbook not too many will have the company's first Beech, the first of Eagle's airline fleet. Beech 58 Baron ZK-ECA, Eagle Air's first Beech, was registered to them on the 10th of March 1975. Over the next months the company made several unsuccessful applications to the Air Services Licencing Authority to operate services from Hamilton to Palmerston North and Wanganui. While not gaining a licence or operate a scheduled service the compnay did manage, by what the Licencing Authority described as "doubtful" means, to establish a twice-daily air taxi service with a published timetable between the three centres starting in October 1975. With the withdrawal from these routes by Capital Air Services in 1977 Eagle was granted its own licence and subsequently purchased its first Chieftain and the Eagle began to soar. PS - I know "Beech 1900D" should read "Raytheon 1900D" but who calls them Raytheons????? Noted heading back to the Coast from Paraparaumu yesterday was Air West Coast's Piper Chieftain ZK-VIP. It has been used for some months by air2there on their Cook Strait services. Is it the end of the charter or back to its Gloriavale Community home at Lake Haupiri for maintenance??? "There was a post run from NV-DN-NV which started in 1995 and Cherokee 6 DBC was used, which was owned by Alan Johnson. This did about 2 years service before it crashed on the beach at Spit Island, Preservation Inlet. RTS was then brought in from Australia, and was operated right up until the service stopped at the end of 2009, when the post vans started doing it, for a lot less cost." If anyone would happen to know the actual date of the last courier run that would be much appreciated. Sadly courier flights by third level airlines are becoming a thing of the past. Stewart Island’s first air service was operated by Grumman Widgeon amphibians operated by an Invercargill company, Amphibian Airways. 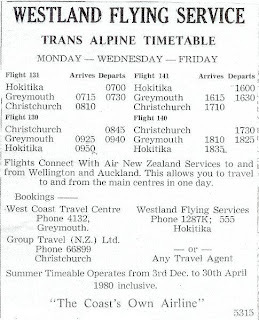 The service was later sold to NZ Tourist Air Travel which was later brought out by Mount Cook Airlines. 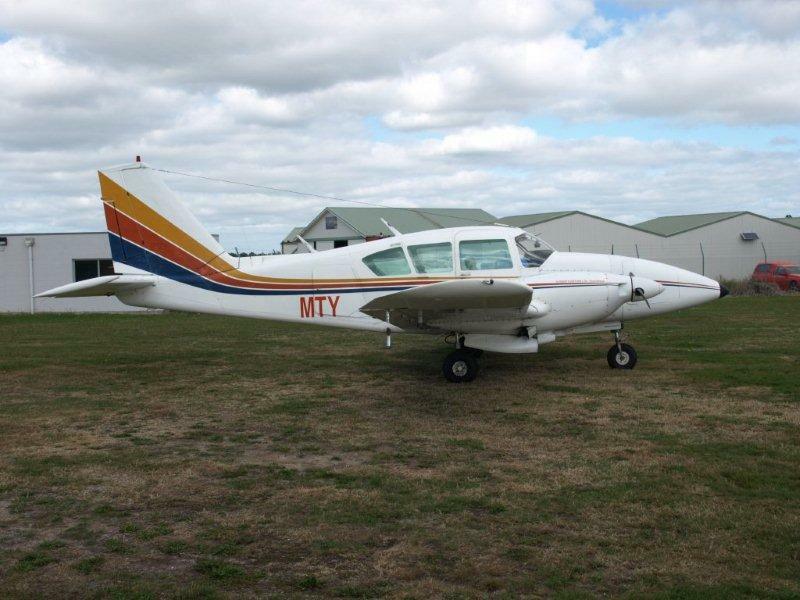 In 1976 Mount Cook Airlines sold their amphibian operations at Invercargill and from Mechanics Bay in Auckland. 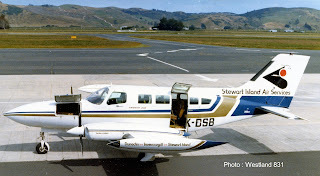 The Invercargill operation was taken over by Stewart Island Air Services who applied the Air Services Licencing Authority in June 1976 to operate non-scheduled and charter services between Invercargill and Stewart Island, and charter and taxi services from Stewart Island with one Britten Norman Islander. After being granted the necessary licence the company looked to the construction of the Ryans Creek air strip. The Mount Cook Airlines amphibian service ended on 3 September 1976 and this passed on to Stewart Island Air Services. The company leased a Widgeon (though ultimately two Widgeons were to be used, ZK-AVM and ZK-BGQ), from Auckland’s Sea Bee Air to ensure the continuation of the service until he Islander service could be started. 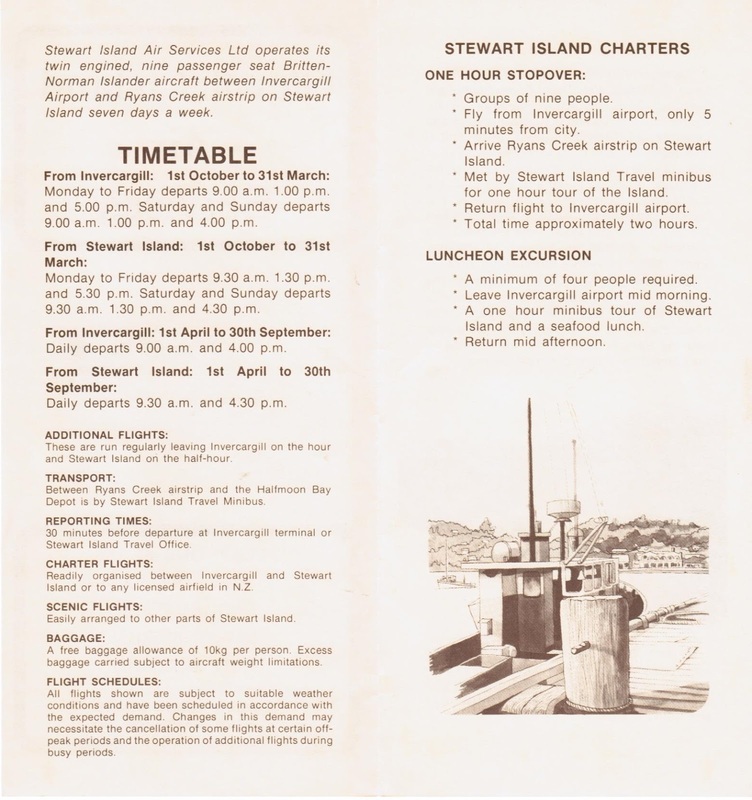 In a letter sent to Stewart Islanders on the 8th of September 1976 the company said provided no further delays are encountered with approvals for the establishment of the air strip, construction should be near completion within four months. In the meantime Captain Murray Donald was appointed to fly the Widgeons daily except for Wednesday and Thursday. The ferry, the MV Wairua, ran on a Wednesday so this meant that Thursday was the only day when the Island was without some form of transport to and from the Mainland. 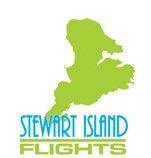 Flights were scheduled to leave Stewart Island at 9.30 in the morning and 4.30 in the afternoon. The company received a Government grant of $10,000 to cover losses which is would incur on the amphibian operation and to ensure the continuity. Above, Grumman Widgeon ZK-AVM at Invercargill on 7 September 1976. 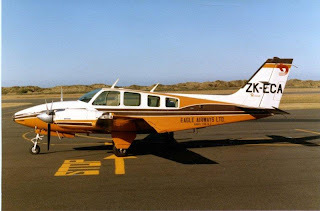 The second Widgeon used by Stewart Island Air Services was ZK-BGQ, again at Invercargill on 30 November 1976. A scan of a photocopy of a photocopy. Graeme Noble, Keith Smith (directors), G McGreaty (the ferry pilot) and Captain M Donald stand in front of Islander IAS at Invercargill after its arrival from Auckland. 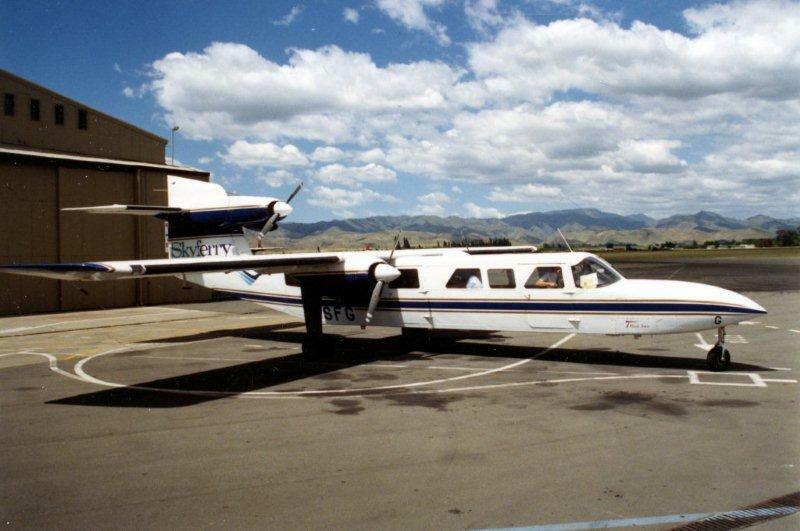 Source and date of photo unknown, however it was before the Islander went on charter to Mount Cook Airlines.The Islander actually had a spare engine for BGQ in the back of it when I arrived from Ardmore. One of BGQ's engines had failed a few days before and the replacement engine was needed in a hurry. Other directors included William Todd, Sam Nicol, Joe Cave, Bill Hazlet, Keith Smith, John Matheson, Warren Broughton, a Mr Jenkins and Harvey Forrest. While awaiting for the completion of the air strip, the Britten Norman Islander, ZK-IAS was leased out for a time to Mount Cook Airlines and later to the Auckland Aero Club. It’s first trip to Stewart Island was on the 14th of December 1977 carrying a new engine for the amphibian that had broken down. 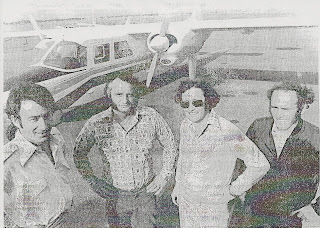 The final Widgeon flight took place on the 20th of January 1978 with the new Islander service to the new 610m Ryans Creek airstrip starting the following day. Touchdown at last - the long awaited arrival of the Islander at Ryans Creek on 20 January 1978. Scheduled services commenced 21 January 1978. Source of photo unknown. Britten Norman Islander ZK-IAS in her original colour scheme at a gloomy Invercargill on 17 May 1978. In these early days Lloyd and Beryl Wilcox of Stewart Island Travel, met the aeroplane at the strip, taking passengers, animals, post, newspaper and food to town by the yellow Ford Transits. 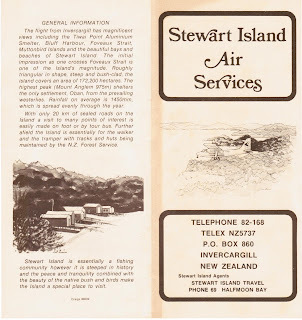 From 1 April 1980, with the withdrawal of Air New Zealand’s Boeing 737 flights between Dunedin and Invercargill, Stewart Island Air Services spread and its wings and introduced a twice weekday return service between the cities. The company initially opted to introduce a De Havilland Canada Twin Otter for the service but instead the company obtained Cessna 402 ZK-DSB and Piper Aztec ZK-TJE to service it. Cessna 402B ZK-DSB (above) at Dunedin on the afternoon flight from Invercargill in January 1981. 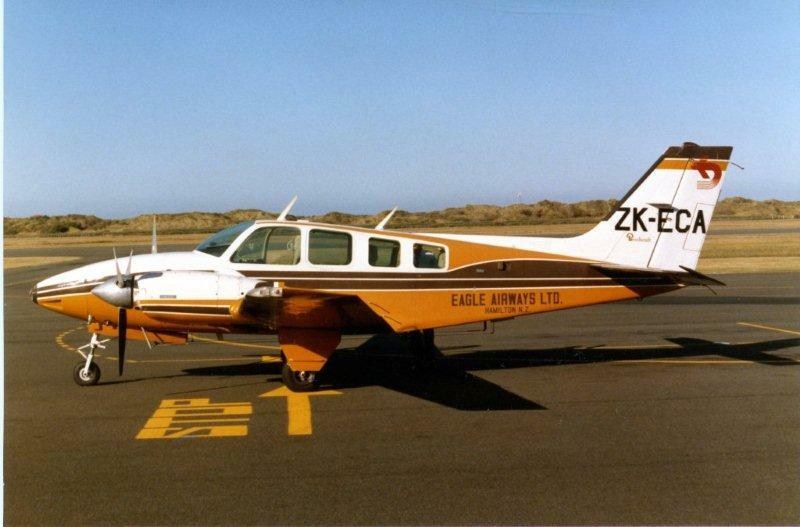 I was rather surprised when a short time the 402 arrived the Piper Aztec ZK-TJE (below) arrived on a courier flight from Invercargill. On the 27 October 1980 disaster struck the company when the mainstay of the Stewart Island run, Islander ZK-IAS, crashed on approach to Ryans Creek following encounter with windshear and turbulence on short finals. The aircraft was disassembled and flown as an external load by helicopter from Stewart Island to Invercargill by AS350 Squirrel ZK-HMY on 3 November 1980 and was written off. One of the more stunning colour schemes to see service in New Zealand... Britten Norman Islander ZK-IAS at Invercargill on 4 March 1979. 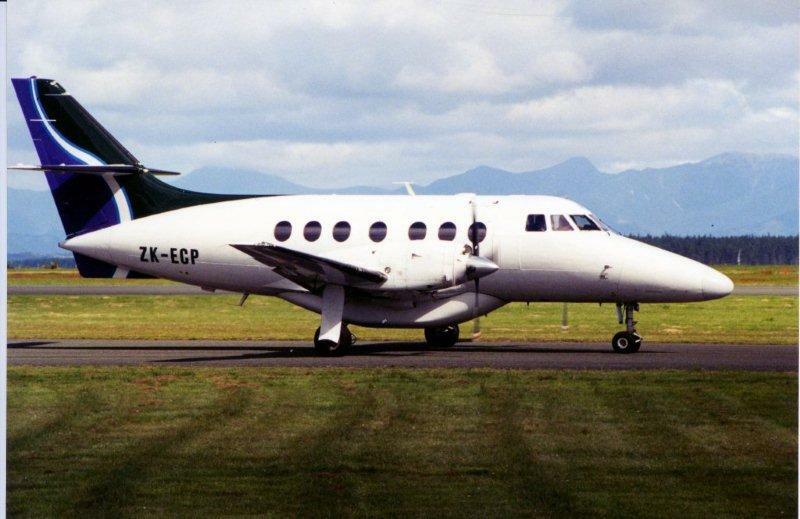 While a replacement aircraft was sought Islanders ZK-DBV and ZK-MCE were leased from Mount Cook Airlines. 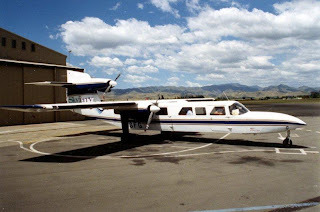 IAS’s replacement came in the form of GAF N22 Nomad ZK-SAL and at this time the company changed its name to Southern Air reflecting that it wasn’t flying to Stewart Island alone. Southern Air will be the second part of this series on New Zealand’s southern most airline. A big thanks to Jordan Kean for his help on this piece. 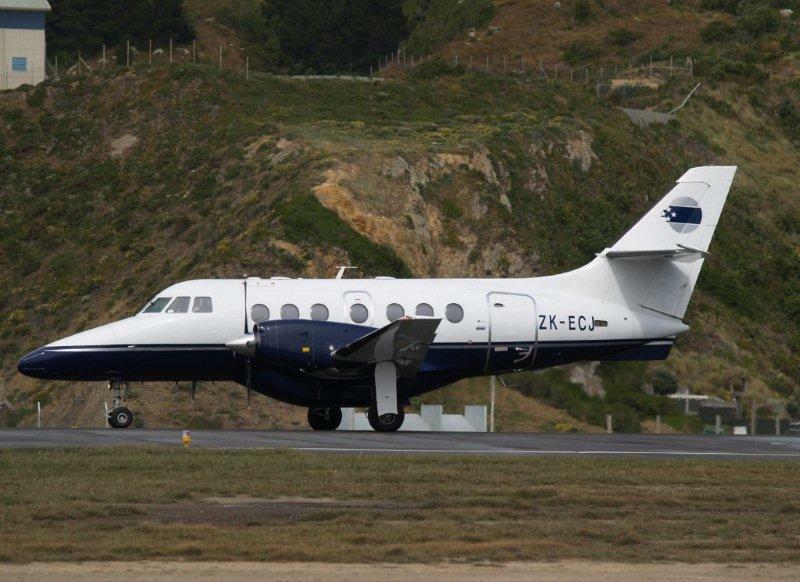 Further to my question whether Golden Bay Air's Warrior EQS had titles, Blue Bus of the NZ Civil Aircraft blog (http://www.nzcivair.blogspot.com/) sent this photo which answers the question. Rodney left a comment that it is used for scenic flights in the Takaka area but it has also been seen doing the scheduled service to Wellington when numbers are light. The following note is on the Golden Bay Air website... "Our scheduled flights are seasonal. This year our flights cease on 18 April and recommence 22 September. Next season's schedule will be published by late May/early June. If you would like to be advised when bookings become available, please email us." 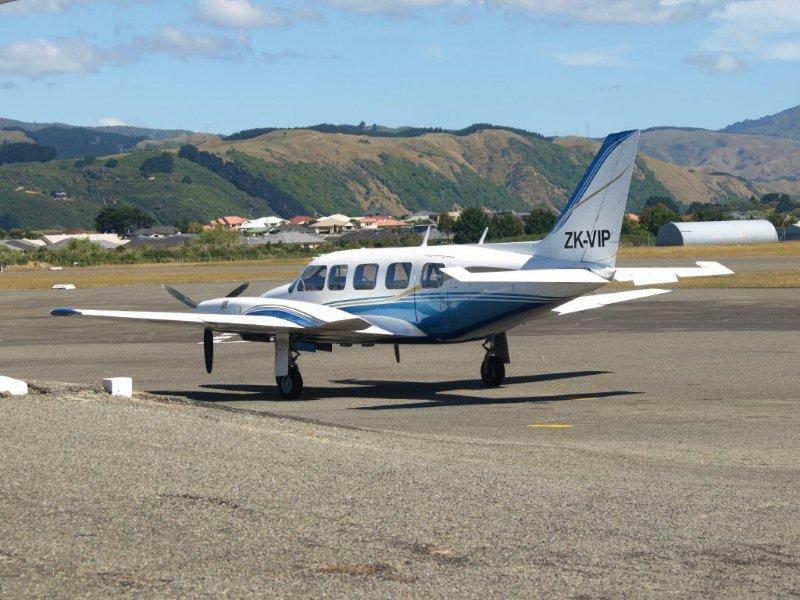 Bay of Plenty-based operator Air Discovery is offering unscheduled, as-required flights linking Gisborne, Tolaga Bay, Ruatoria, Waihau Bay, Opotiki, Whakatane and Tauranga. Pilot Daniel Gillett said the decision to extend passenger flight service to Tairawhiti was in response to the region’s need for an alternative travel solution to navigate across the region. “We fly on demand,” he said. Airstrip agreements have been signed and there are plans to include Te Araroa as part of the available flight locations. Air Discovery hoped to team with local operators to fly the legs closest to Gisborne, he said. “We are looking to strike an agreement with the Gisborne-based aircraft charter company, so our prices will be significantly less for flights to and from Gisborne, Tolaga Bay and Ruatoria,” Mr Gillett said. Prices begin from $199 per person on a minimum two-passenger flight. Flights around the Gisborne area are expected to cost more at this stage – around $500 for the more expensive flights. “If we have to ferry an aircraft from Whakatane to Gisborne, then obviously there is an expense to fly from there,” Mr Gillett said. Mr Gillett said although things were still “very much in the works”, feedback had been positive. 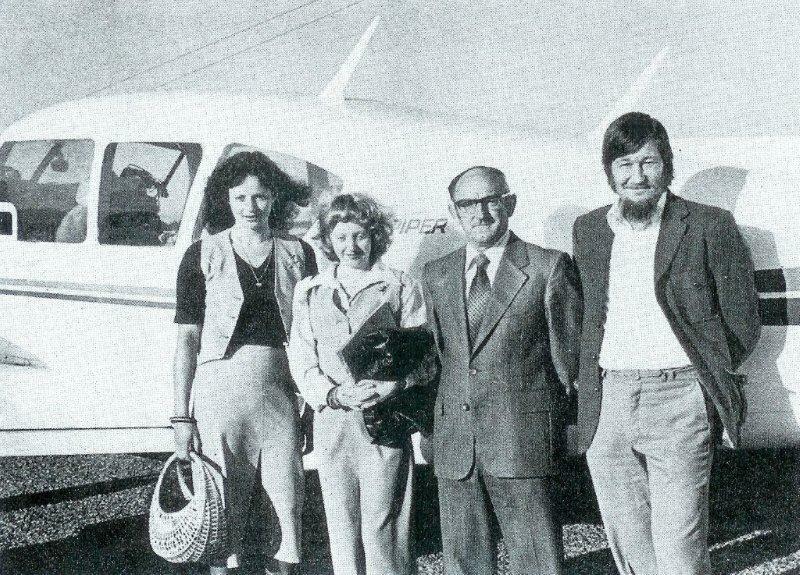 “At this stage the rate is good for any flights closer to our side (Whakatane and Tauranga) but everything else is more expensive than we would like.” As part of the plan to bring prices down, Mr Gillett hoped to eventually turn the as-required flights into a daily service. But it was “a numbers game”. “It’s going to start as an on-demand service but if we can work up the numbers, we will hopefully put in a daily scheduled flight service. If the numbers are there, we will look at a route we would fly every day. It would bring the flight down to possibly $50 between Ruatoria and Gisborne.” “It takes an awfully long time to get around the Coast in a car... I think there will be a big market for us flying trades-people around the East Cape, and of course there’s the tourist market as well,” he said. He referred to workmen who recently needed to fly from Rotorua to Ruatoria to fix a mobile oxygen system. Mr Gillett had been aware of demand for alternative transport in East Cape for a while but the recent flight from Rotorua “basically confirmed it for us”. Air Discovery was in contact with a number of accommodation providers regarding potential package deals for tourists. “There’s a real big interest regarding Waihau Bay for game fishing and a spot of hunting.” The flight service would be the first of its kind for the region in at least 20 years, Mr Gillett said. Air Discovery is expected to meet with Gisborne District Council regarding the potential airstrip use in Te Araroa on August 12. I notice on the FlyDirect website a change of timetable as detailed below. Changes include Wellington getting 7 flights a week instead of 10 and Christchurch similarly having three flights per week cut from their schedule. The big change however is that the timetable can now be operated with one aircraft. 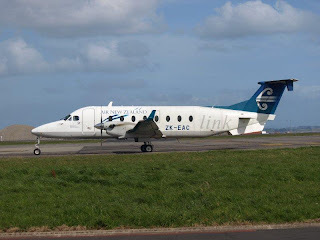 The website says, "Our aircraft providers operate a 40-seat aircraft on our routes to Wanaka from Wellington and Christchurch" so it looks as if the Air Chathams Convair is getting the flick in favour of Vincent's Dash 8. Air National was founded in 1989 as a dedicated charter airline, initially trading as Menzies Aviation. In 1992 the company was renamed Air National Corporate Ltd and the following year added an Embraer Bandeirante to its fleet and began supporting scheduled regional airline services. 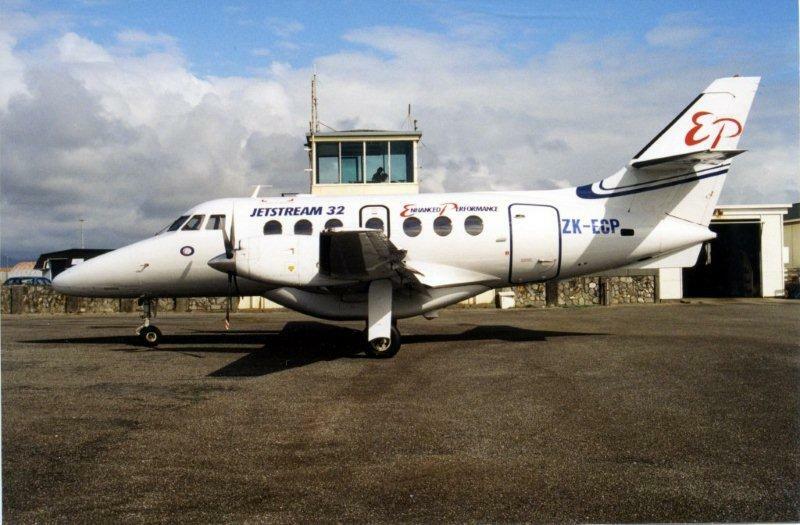 The company introduced its first British Aerospace J32EP Jetstream, ZK-ECN, the “City of Rotorua” to its fleet in. 1996. In 1997 it began using ECN for services between Auckland and Rotorua on behalf of Ansett New Zealand Regional. In September 2000 ECN was registered to Tasman Pacific Regional Airlines, operating with Tasman Pacific Connection titles and with their colours on the tail. It returned to Air National in July the following year. 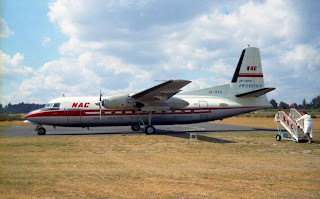 ZK-ECP was added to Air National’s fleet on the 30th of July 1999. Like ECN it too had 10 months with Tasman Pacific Connection. Above, BAe Jetstream 32 Enhanced Performance ZK-ECP as she first arrived in New Zealand at Hokitika on 5 September 1999, while below ECP reflects her time with Tasman Pacific Connection at Nelson, but back in Air National service, on 2 November 2001. In January 2006 Air National commenced support services for Air New Zealand Link’s Eagle Air between Auckland and Kaitaia providing twice daily return services on weekdays. Later that year, in August, Air National also received a contract to fly Air New Zealand Link’s new Christchurch-Oamaru service (see http://3rdlevelnz.blogspot.com/2010/01/31-december-2009-air-new-zealand-drops.html) as well as to fly one or two flights between Christchurch and Hokitika on a daily basis. To facilitate this, and other back up work for Eagle Air, Air National obtained three additional Jetstreams. The first, ZK-ECI, has had several personas in New Zealand. It began as ZK-REY operating for Ansett Regional from March 1999 to the end of August 2000. It too saw service with Tasman Pacific Connection who reregistered it as ZK-TPC. Following the collapse of Qantas New Zealand it was unused for some time before being picked up by Origin Pacific who registered it ZK-JSU in May 2006. Following the subsequent collapse of Origin Pacific it again languished until purchased by Air National in July 2006. It was registered ZK-ECI and named “Spirit of Waitaki” and flew the inaugural Christchurch-Oamaru service. ZK-ECI, the Spirit of Waitaki, at Kaitaia on 24 July 2008. The other two Jetstreams had a similar journey through New Zealand companies. ZK-ECJ began life in New Zealand as ZK-RES with Ansett New Zealand Regional. It retained this registration with Tasman Pacific Connection before becoming ZK-JSR with Origin Pacific. It was registered to Air National as ZK-ECJ in July 2006. ZK-REW also did service with Ansett New Zealand Regional and Tasman Pacific Connection before going to Origin as ZK-JSQ. It was also registered to Air National on July 2006. Above, ZK-ECJ at Wellington on 15 November 2007 with ZK-ECR below taken at Wellington on the following day, 16 November 2007. At various times Air National’s Jetstreams, or ‘Sodastreams’ as the irreverent might call them, have been running regular services between Auckland and Taupo, Wellington and Wanganui, Wellington and Westport and Wellington to Blenheim and onto Christchurch as well as the routes mentioned above and for back up work for Eagle’s Beeches that are on maintenance or go unserviceable. With the economic recession these regular flights have all but disappeared. From my reckoning the only regular route the Jetstreams are used on is three days per week between Christchurch and Hokitika. The Christchurch based aircraft is swapped each Friday with a return Christchurch-Blenheim-Wellington service being flown. With Eagle running a leaner service these days one wonders what work Air National will find for their Jetstreams in the future. Sunair’s newest Aztec has been eluding me for some time but I finally caught in today at Hamilton. The Aztec arrived in New Zealand from Australia as VH-MTY in February last year (http://nzcivair.blogspot.com/2009/03/zk-pending.html) and was registered as ZK-MTY as Sunair’s ninth Aztec (http://3rdlevelnz.blogspot.com/2010/03/aztecs-of-sunair.html). MTY carries small Sunair Aviation titles on the engine cowls. Sunair have a new timetable as shown on their website (www.sunair.co.nz). Changes include Palmerston North and Whakatane being dropped from their destinations while two new routes are listed. The first is a new Napier-Paraparaumu-Napier service. This service, which is primarily a courier run, has operated for some time. This is the first time, however, that it has appeared on their schedule as being available to passengers. Also listed on the schedule is a timetabled Whitianga-Great Barrier service. Tri-motored aircraft are not unknown in New Zealand. The first trans-Tasman flight was flown by Charles Kingsford Smith in a tri-motored Fokker F.VIIb/3m, the Southern Cross. Mercury Airlines and later Great Barrier Airlines flew an Australian tri-motor De Havilland Australia Drover ZK-DDD. More well known was Air New Zealand’s fleet of tri-motored McDonnell Douglas DC-10s. Twenty years ago, this month, New Zealand saw the introduction another tri-motored aircraft, the Britten Norman Trislander. Trislanders had been mooted for service in New Zealand before this. In 1973 NAC did a running cost comparison between two Trislanders as opposed to one Friendship. 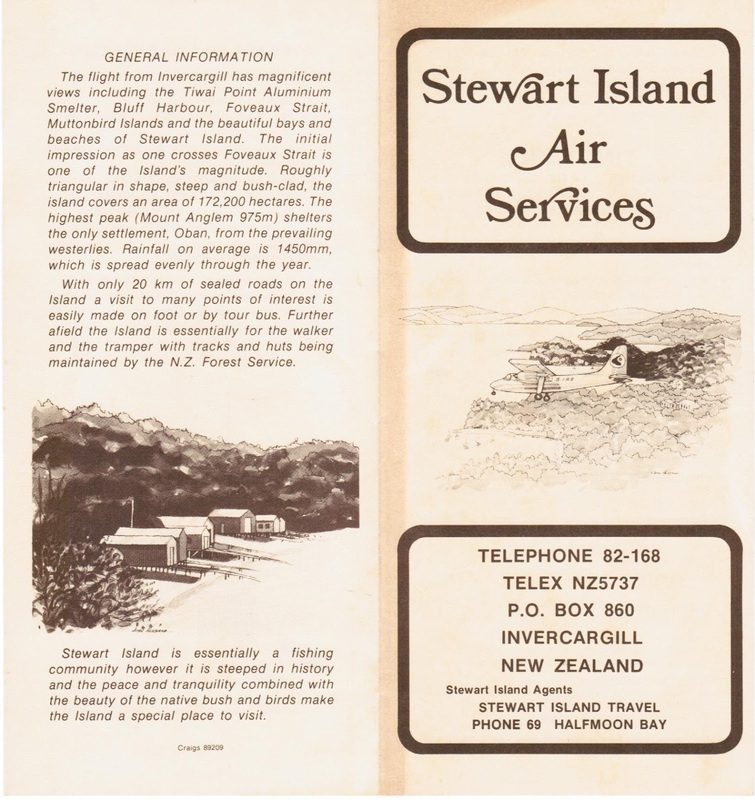 In 1980 Stewart Island Air Services evaluated the possibility of using a Trislander on its flights between Invercargill and Dunedin and Invercargill and Stewart Island. Neither evaluations came to anything. 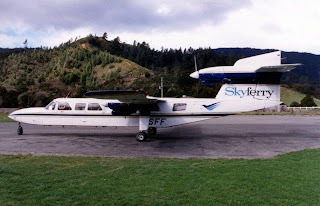 Eventually it was Skyferry who was first to introduce Trislanders to New Zealand skies with ZK-SFF starting flying their services between Wellington and Picton and Wellington and Blenheim on the 12th of April 1990. This was followed, much later than expected, by ZK-SFG in September that year. Trislanders are long... ZK-SFF at Picton's Koromiko airport on 14 December 1990. NZ Wings gave a good description of the Trislanders in the October 1990 issue; “The two unique aeroplanes are of Belgian manufacture, being put together at Gosselies in 1976 when Britten-Norman was part of the Fairey Group. As with their older cousins, the Islanders, the three-engined Trislanders were ferried "home" to Bembridge on the Isle of Wight for completion as -2 models with a long nose, droop flap and wing tip tanks. The impressive slim line commuters are powered by three 260 hp Lycoming 0-540 E4C5 engines, have a wingspan of 53 feet and a MAUW of 10,000 lbs.” Skyferry operated their Trislanders with two pilots with seating for 14 to 16 passengers depending on luggage. By mid 1991, however, Skyferry was in serious trouble, the Trislanders contributing significantly to this. The company was placed in receivership on the 14th of July 1991 and at that time Cliff Marchant commented to NZ Wings that when they arrived the pair of Trislanders weren't in such good condition as at first thought. "They cost a lot to get running. ATD hit us with a lot of new requirements that weren't on existing operators. We took six months to get over that, and they relaxed the requirements in the end. The engineering staff were slow in getting the Trislanders going. They overdid the budget last year. Our sundry spares stock went from $40,000 to $250,000 in three months. We were stripped of working capital. In one year wages increased by 250 percent with only 25 per cent more work done. "We had a shootout with the engineering manager and in November went to Safe Air. As soon as the Trislanders went there for maintenance, things changed dramatically, with good reliability. They're an excellent organisation." Spot the nose. ZK-SFG outside Safe Air at Blenheim's Woodbourne Airport, 15 December 1990. 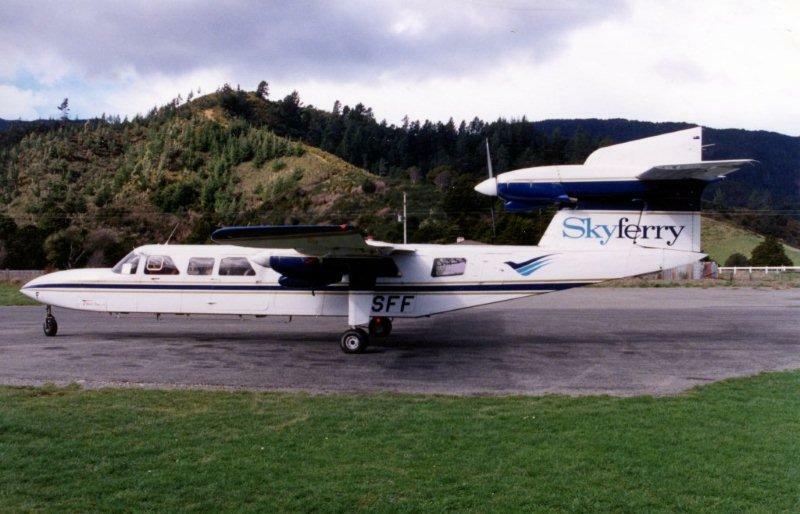 With Skyferry in receivership the Trislanders were parked at Woodbourne and eventually sold in the UK, their New Zealand registrations cancelled on 23rd of December 1992. 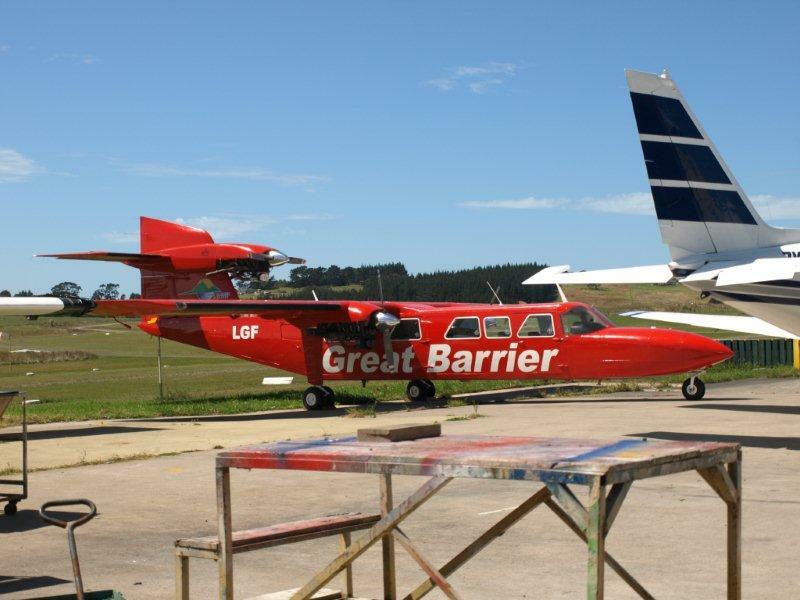 10 years later, TO THE DAY, another Trislander was registered in New Zealand, ZK-LGR, being the first of Great Barrier Airlines Trislanders, but that is another story! "When they arrived the pair of Trislanders weren't in such good condition as at first thought," Cliff Marchant said of the Skyferry Trislanders. I wonder if Great Barrier would say the same of ZK-LGF... It arrived on the 26th of November last year and is still to enter service. A just in case shot at North Shore on 6 March 2010. Passengers on scheduled flights from the Bay of Islands Airport could be charged a departure tax from July 1 by airport owner Far North Holdings. The Far North District Council-owned firm has signalled the tax in a three-year statement of intent, but has not said how much the tax will be. It also plans to make casual parking at the airport free from July 1 and charge commercial operators an annual licence fee to park at the airport. Far North Holdings chairman Tony Norman told district councillors last month the firm needs $4 million over the next four years to fund the runway upgrade. A departure tax would generate extra revenue of about $120,000 a year, providing income to service new loans for the work. Mr Norman hopes to have more details about the tax after a meeting with councillors at the end of the month. Air New Zealand subsidiary Eagle Air says the national carrier is generally unsupportive of airports imposing taxes above the costs they charge the airline to use them. Any tax is an increase in the cost of travel for consumers in a market where Air New Zealand has been striving to lower the cost of travel, says Eagle Air general manager Carrie Hurihanganui. The airline doesn't collect departure taxes at three other airports in New Zealand that levy passengers travelling on scheduled domestic flights. It wouldn't assist in the collection of a tax at Bay of Islands Airport either, Ms Hurihanganui says. Palmerston North International Airport introduced a domestic departure development levy in 1990 to meet its interest costs of borrowing for major redevelopment works, including a new terminal. The levy payable by each passenger aged five years and older was initially $3, but that has since been raised to $5. Passenger numbers through Timaru's Richard Pearse Airport have dipped for a second year in a row, with no sign of a recovery in patronage. Eagle Air, an Air New Zealand subsidiary which flies the Timaru-Wellington route, has reported a 9 per cent drop in the year to March. While there are no changes planned to the existing service, the company has warned that passenger numbers need to increase. General manager Carrie Hurihanganui said the route had been hit hard by the recession and numbers did not look like recovering. "Eagle Air has needed to ensure it closely matches capacity to demand – we are now down to 19 [return] trips per week on this route versus 24 trips two years ago." Ms Hurihanganui said the 12 months to March 2009 saw a 14 per cent fall in passenger numbers. "The Timaru region demand seems to have been affected significantly by the economic downturn and there are no signs yet of a recovery. We continually monitor our network and route performance and while there are currently no changes planned for the service, we do need passenger numbers to improve again. "The key for regional routes, such as Timaru's, is for the local community to regularly support the services and increase that demand from and to the area." My question would be, how has the number of Timaru travellers flying through Christchurch increased??? And, how many of these have used Jetstar or Pacific Blue??? Towards the end of 1976 two Hokitika men, Norm Bishop and Pat Pascoe, successfully applied for an air service licence using Piper Cherokee 6 (ZK-ECV) from Hokitika for scenic and charter work. Tom Sunnex was appointed as the first full-time pilot and the company became busy with a range of air charter and scenic flying, the mainstay of the operation in the early days being scenic flights from Hokitika over the Franz Josef and Fox Glaciers and around Mount Cook. The aircraft was also used for local air ambulance work. Westland Flying Services' first aircraft Piper Cherokee 6 ZK-ECV taken at Hokitika in the late 1970s. The company soon started flight training, initially with Piper Cherokees but later with Cessna 172s. As a high school student a friend and I rang up about the possibility of a local scenic flight – we had the princely sum on $5 each... it was suggested instead of a local flight there were a couple of seats going to Motueka in the Cherokee 6 if we would be interested... as if we wouldn’t! 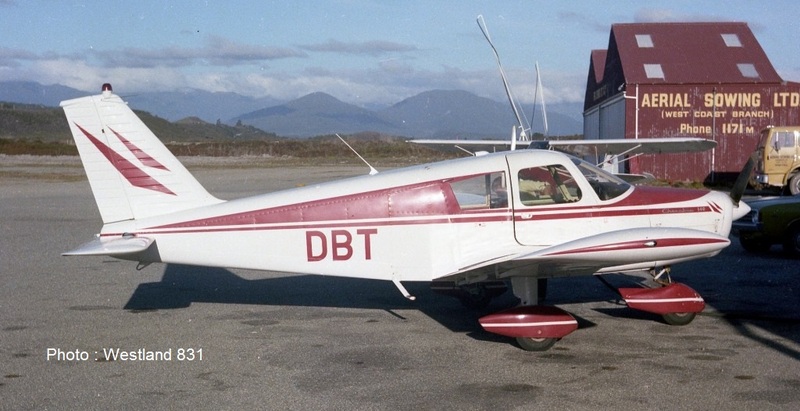 A classic old Piper Pa28 Cherokee 140 ZK-DBT was used for flight training. It is seen here basking in the glorious Hokitika sunshine in September 1978. In 1979 the company saw the need for an IFR-equipped aircraft and it hired Cessna 320E Skyknight ZK-EGN. During this time the company applied for the addition of the right to operate a non- scheduled air service from Greymouth to Christchurch with a connecting air taxi service from Hokitika to Greymouth. This was granted in November 1979. 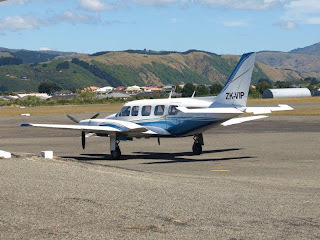 The Greymouth Evening Star reported that the Cessna 320 would leave Greymouth early each morning for Christchurch, giving travellers the opportunity of connecting with other early flights at a single flight cost of $33. Cessna 320 ZK-EGN was used for a short time on charter work and scenic flights. It is seen at Hokitika in 1979. At that time the company was looking for a new six-seater aircraft to replace Cessna 320 but in the event in December 1979 the company applied and was granted the right to replace the Piper Pa-32 Cherokee 6 in its licence with a Cessna 402 and ZK-DHW was purchased from James Air. 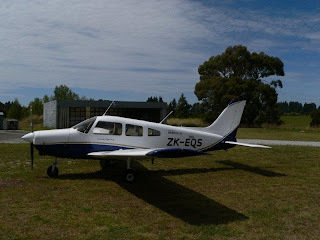 In the meantime the service however began on 5 December 1979 using Air Charter (Christchurch)’s Piper Pa23 Aztec ZK-DHB. The Aztec flew Christchurch-Greymouth-Christchurch flights on the 5th and 7th while the company waited the arrival of the Cessna 402. 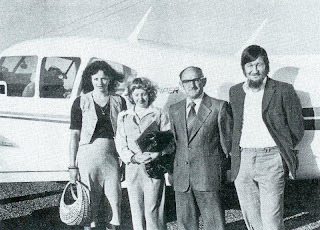 The first passengers on the first day of operations, Mrs D Ferguson, Miss V Bannon and Messrs S Orr and R Coburn in front of Air Chater's Aztec ZK-DHB. Source : Greymouth Evening Star 5 December 1979. Tragedy struck the company a few days later on the 8th of December when its Piper Pa28-140 Cherokee ZK-EBY crashed on the Styx Saddle killing all four on board. With the arrival of ZK-DHW the company began normal services on Monday the 10th of December. The Hokitika Guardian reported that the service departed on time with three Hokitika businessmen and picked up five more passengers at Greymouth. On the return flight besides passengers the plane carried 200kg of urgent freight for the West Coast. The service operated on a return basis twice daily on Mondays, Wednesdays and Fridays. Tom Sunnex had returned to the company with the purchase of the Cessna 402 and he along with Geoff Painter were the main pilots for the air service to Christchurch. Westland Flying Services' Cessna 402 ZK-DHW retained its James Air origins but carried Westland titles and a small white heron on the nose of the aircraft. Photo taken at Hokitika in April 1980. In addition to the air service the 402 was used on scenic flights to Mount Cook and the Glaciers, and for passenger and freight charters. It flew both whitebait and live deer to the North Island. The 402 would also occasionally offer charters to Christchurch to fly Air New Zealand passengers when the Friendship service was cancelled. During 1980 negotiations were entered into for Westland Flying Services to take over some of Air New Zealand’s unprofitable services. Local interests soon stymied this as an option. Westland Flying Services had a counter in the Hokitika terminal but all the flights left using the company's office in the Hokitika Aero Club hangar. The Cessna 402 was marginal operating in and out of Greymouth. Westland Flying Services faced the same problems as Capital Air Services had operating from Greymouth’s short runway. In summer the aircraft could use the grass overrun (which has subsequently been sealed) but they could not do this in winter restricting the load. 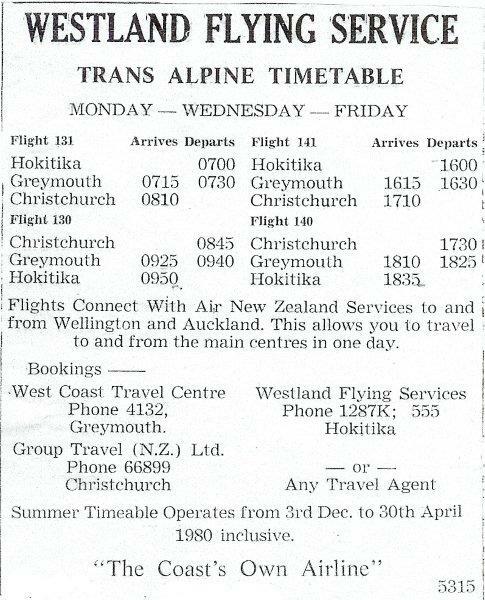 Also, at this time, Greymouth and Hokitika were not equipped with runway lights and the schedule had later winter departures in the morning and earlier departures in the evening making it less convenient for business people. In November and December 1980 GAF Nomad, VH-BFH, (later Southern Air’s ZK-SAL) and Mitsubishi Mu2, N671MA, (later Air Central’s ZK-EKZ) were demonstrated to the company. Both the Nomad and Mitsubishi were capable of handing Greymouth but the cost of stepping up to turboprops was prohibitive. In mid January 1981 it was announced that Westland Flying Services would cease its thrice weekly service on the 30th of January citing that costs and poor passenger loadings had made the service uneconomic. The company intended to continue its charter and scenic flights. At this time The Press was told, “two people were on stand-by for yesterday's flight, but there are many days when there has only been one passenger each way." As a high school student who hung around the airport I didn’t mind these light loadings as I was lucky enough to score a few trips to and from Christchurch. On one memorable day when fog in Christchurch had delayed the morning flight I went over and back twice in the one day! 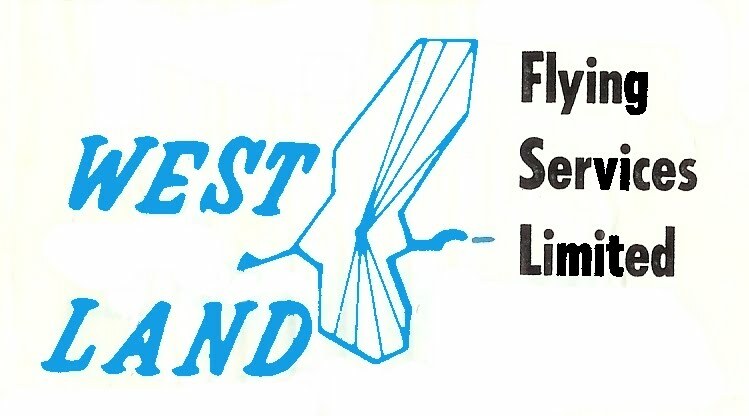 Westland Flying Services was, again, an airline that looked for a niche, that, is to provide Westland with a service suitable for businessmen, something the two mid afternoon Friendship services to Wellington (via Westport) and Christchurch failed to provide. Like a lot of other similar attempts it was thwarted by the equipment used, people not having through fares to other destinations, a poor public perception of small aircraft, in their case an unpressurised aircraft over the Alps and the short, unlit runway in Greymouth. And finally, Westland 831 - the morning flight to Christchurch waking me to get to school! New Zealand's Internal Airlines - Part 4 "Q-Z"
New Zealand's Internal Airlines - Part 3 "H-P"
New Zealand's Internal Airlines - Part 2 "B-G"
New Zealand's Internal Airlines - Part 1 - "A"